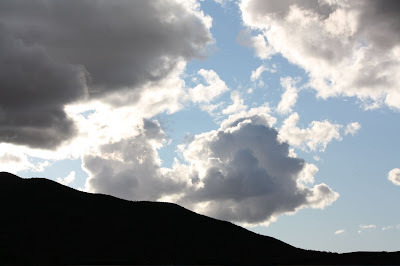 Is this photograph, taken Sunday in the Sonoran Desert, about the sky or the clouds? Or could it be, perhaps, about the blackened mountain ridge with Saguaro Cacti perched on its edge? Applying his famous inkblot test, Dr. Rorschach would have his interpretation. I must admit that I see the storm clouds gathering. Soon, as the wind accelerates to the call for action, more cumulus layers will arrive on cue, as water molecules join forces, preparing for an unusual desert snowstorm. To impress, I might have said I see the radiant blue sky, its allegiance to the sun, melting the clouds, dissolving their moisture, in a loyal show of optimistic clarity. And then there is the mountain. Terra firma. What will the next bring? The answer may be in the photograph. If you look closely, the words Expect Good can be seen obliquely in the clouds. The New Year will unfold as it always does, regardless of the weather, in a perfect pleat. Cheri, I see the clouds as non-threatening. Actually, I feel, more than see, peace and serenity in the scene. I sense warmth without it being hot, a light breeze, sunset coming perhaps. A pleasant night under the stars, small clouds drifting across the heavens in the offing. The eye might see more than the camera does, color in the hillside that the camera lens couldn’t imprint on the film (or in the memory card). Subtle colors of dark brown, the sand and rocks obscured in shade. Have a happy, safe, and prosperous New year. I thrive on optimistic visions, and you and I are both seeing those silver linings. Looking forward to your blogs of 2010 minus 1 (I’ve decided I don’t like the idea of 2009, so this is how I am going to refer to this coming year)! Certainly the clouds in this photo look like a sign of something unhappy,devastating. But I found it mysteriously beautiful, and really appriciated and enjoyed. You are such a good photographer that you can take this shot focusing on this beauty, and enable you entertain someone who look at it. That’s pretty nice of you, if would have been by chance, I think, and that can be the real answer you can take from this photo. Well, what I mean is that the new year of 2009 will precisely turn you on, as long as you can get the way of thinking like that. Well I for one–didnt put alot of thought into this pciture. I simply wished and longed to be lying on the ground at that very monet looking up into the sky! Those are the moments that life should be filled with. I can almost hear the silence now-with just a whisper of wind. I love these moments..I envy you right now. These small blinks of happiness keep me going and they are so hard to find in the cold NY winter months. But I shall live through you for the time being- so please keep these glorios shots coming!! the contradition itself of the looming, ominous clouds and the message ‘expect good’ is certainly something to ponder. do we listen to what the eye sees right out in front? or do we pay attention to the interpreted meanings, the deeper thoughts that go into a striking image? may God bless you and the new year. I appreciate your thoughtful comments and questions. Certainly, when rain clouds threaten, it is time to get off the golf course! Some of us approach life like Chicken Little. Expecting Good can alter the way we face our lives and their challenges.